Right now I am thinking “what have I gotten myself into! 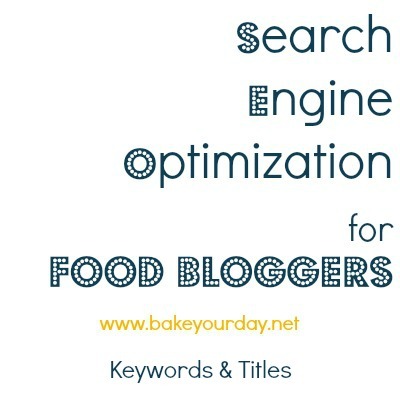 ?” After last week’s SEO for Food Bloggers Intro Post, my head has been literally spinning nonstop with ideas, thoughts and directions for this series. I get started on an idea and then trail off into a whole other idea! I received many ideas and questions from you all, the biggest being “how do I get my thumbnail to show up in a Google search?” We will get to that in a couple of weeks, I promise. Today’s theme is keywords and titles. All are extremely important when it comes to optimizing your content for search engines because they help search engines understand what you blog and blog posts are about. This is a long post so I have tried to break it up with bullets, short paragraphs and section titles. Grab a cup of coffee and hang out a minute. Keywords are used to describe a theme across your blog, or your blog post. When you think about keywords, think about what people might be searching to find your blog. Are you a gluten-free blogger? If yes, then gluten-free might be a good keyword for you to use. Aim to use keywords that would likely be used by people who search for recipes. A note about keywords: you’ll sometimes see them described as meta keywords, meta tags, tags, etc. Essentially, they are all the same thing. When I say tags, I am not referring to the tags that you add to your post (located under the Categories section.) Those simply allow a way for you to organize your blog posts by grouping similar posts together. Focus on 1-2 (maybe 3) good keywords per blog post and use one major keyword in the first few sentences. Use the strongest keyword throughout the whole post: in the text of the post, in the title of the post, in the URL and in the photos titles. Don’t overuse keywords – what I mean by this is don’t make your post sound like you are a robot, just to use your keywords. Talk naturally, your readers will like you better! 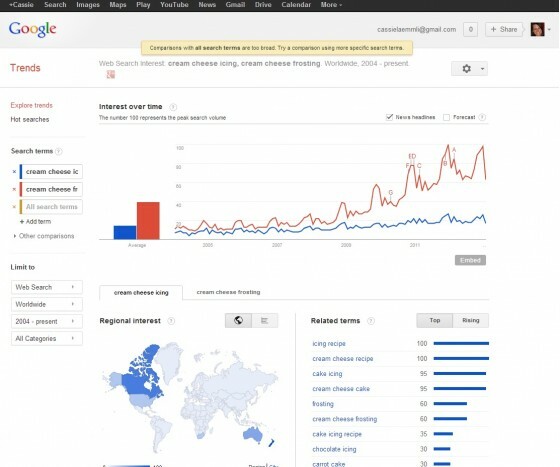 Use tools like Google Trends. Figure out what people actually are searching. For example, if I am making Homemade Oreos with Cream Cheese Frosting, I might wonder if folks search for Cream Cheese Frosting or Cream Cheese Icing. Based upon my quick search, more people search for frosting than icing. So I would use frosting as a keyword in my post, title, URL, photos. One last thing on keywords: both SEO plugins that I will recommend help with keywords. I am going to cover those fully in two weeks but if you are anxious, check out All-In-One SEO or WordPress SEO (this is the one I use.) These are WordPress plugins so if you don’t have WordPress, these won’t really help you. Please email me if you have a question on a specific blogging platform. For food bloggers, tags come into play most-often with our photos. When you upload a photo, it’s important to title and tag it properly so that a search engine knows what the photo displays. Google has no way of actually seeing what you photo is showing. I prefer to title my photos in a Pinterest-friendly manner, and then include the blog post title as the alt text. Ex: Buffalo Chicken Meatballs | www.bakeyourday.net. Don’t skip this box! The alt text should include a brief description of the image. This is how the search engines will know what your photos are. Use a sentence format, no hyphens. 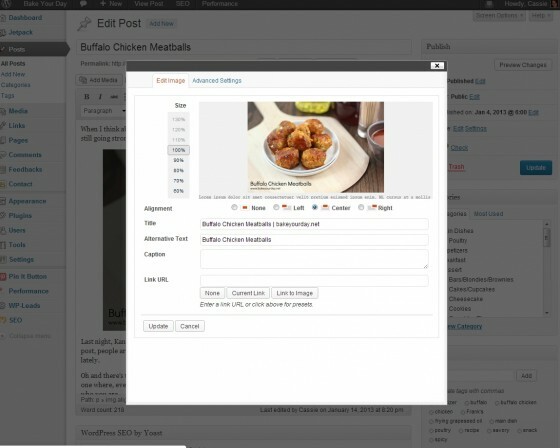 In the example below, you can see that my keyword, Buffalo Chicken, is in the photo title and the alt text. Also, I removed the Link URL. Titles should be written using the strongest keywords of your post. The title should match the URL and photo titles. (We will talk more about URL/links next week.) Choose a Title that has relevance to the content on the page; avoid using “untitled” or “new post”. Be specific, descriptive, and consistent. Below: notice the post is titled Buffalo Chicken Meatballs, the url includes the post title and that title is included in the title of the photo (in the floating layer). Don’t copy and paste the first few words of the copy, actually describe what the recipe is about and what it contains. In the screenshot below, these are the fields that I enter into my SEO plugin. Notice that my keyword Buffalo Chicken shows up in each box. You have homework to do. Go to your top five posts (today!) and make sure that you have correctly keyworded and titled the posts. Yes, this can be time consuming but if you set a goal to just go back to a few posts each day, you will be set up in no time. 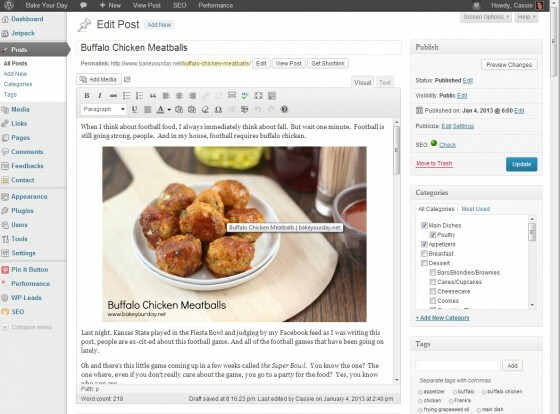 These steps will really go a long way to help search engines recognize your blog content. As I said last week, none of these are quick fixes. SEO is a long-term strategy and while the initial steps can be time consuming, making these steps part of your daily blog post routine will pay off over time! Next week we will talk about links and recipe formatting so send me your questions! So many great tips – never thought to put my url in the title! Can’t wait to follow this series, Cassie!! You’re so clever Cassie, this post is just full of incredible information! As a result, I’ve actually found some useful google support pages about SEO for blogger and I’m making some changes to make sure my blog is as SEO-friendly as possible! Great post Cassie, thanks for sharing!! Also, note that in Blogspot now, titling and adding alt text for images is similar to what you showed for WordPress and much easier than before! When a photo is added to the post, the author can right click on the image and a little bar pops up to help resize the photo, move it, etc. One of the choices in the bar is “Properties” which once clicked opens up a dialog box to enter the Title and Alt text. Thanks so much for letting me know! I will past that info along! Thanks Cassie, I don’t get the option of tagging pictures and the like as I’m.using blogger 🙁 I have a new site being built and will be on WordPress very soon though! Gerry, you actually can on Blogger. I added a a link above and the comment above from Kelsey at K&K Test Kitchen explains too! Great job!! Looking forward to what’s next! Okay, I am totally loving this series. So much great info here Cassie, you rock! I am Loving this series! I just downloaded SEO today and I have so much to catch up on! I really appreciate you doing this Cassie! Love this, Cassie! I have a question, though – why do you remove the link URL? Personal preference, really! I just don’t like it when I accidentally click a photo and it takes me to a different page. Awesome tips, Cassie! I learned so much from this and realized there is so much I’m not doing right now that I should be. I can’t wait to get to work and put your ideas to use! Thanks SO much! Great tips! I have some work to do. these are great tips – thanks so much for sharing! i’m trying to add more SEO to my food blog and like others have said, i have a lot of work to do! Great tips Cassie. I just realized there are a couple of things I had no clue about them, thanks to you, now I have to find the time to fix them! Thanks Cassie! Great series! SEO is a topic that used to make my eyes glaze over. But as I learn little bits here and there it has become more and more interesting. The stuff about whether or not to use hyphens in photo descriptions perplexes me though. Why are the hyphens useful to search engines? Does it really matter if we use them or not? Thanks! For some reason, that’s just how the bots read the photos. Or-so that’s what the research says. I haven’t found it to be the #1 most important thing in SEO, which is why I continue to name my photos for Pinterest rather than Google…I get more “bang for my buck” that way. If you have 50 photos in a post, it might be different. But for my 3-4 per post, that’s how I reason. Hope this helps! Fantastic tips Cassie! I so appreciate you sharing your expertise with us. You rock! Wow, so much info and so much to think about. Just within the last month or so, I’ve been labeling my images with the title it box. But I keep Alt Text blank. Guess I need to be filling that in, too. And I admit I don’t do a thing formally with SEO. I try to write with keywords in mind, whatever they are, and my posts are always titled with what the recipe is. Some people title their posts with things that aren’t even the name of the recipe! Such great info, Cassie. Keep this series up for a long time, please! Thanks, Averie! It kills me to see posts named something that has nothing to do with the actual recipe. Thanks for your support! Such great tips, Cassie! Thanks so much for sharing! Looking forward to the rest of the series! You are so awesome helping us less than techies out. Great job Cassie, I’m learning so much from you! SO helpful, Cassie! I thought I had a pretty good handle on SEO, but there are definitely things that I should be doing and didn’t even realize until I read this post. Thanks so much for taking the time to share all this! Thank you, Cassie! I have never understood SEO – I definitely have some homework to do! Cassie, this is just fantastic! I just downloaded the plug in you recommended and am looking forward to learning more about it. Oh yay! I didn’t know you were switching. Let me know if you have any questions! You are so generous with your information. Bookmarking! I have learned from some very smart, more experienced bloggers (you included) to pay it forward with information, especially this kind of stuff! This is SO awesome! I’m really new to the whole food blogging thing, and I had no idea it was so crucial to title your pictures! I have gone back and titles every single one now 🙂 Will definitely keep reading this series! That’s so great to hear, Yvonne! Thanks for being here! This is so awesome & so helpful! Thanks so much, Cassie! Great info, Cassie! You’re a gem for sharing all your knowledge! This series of posts provides so much great information. I’ve just begun titling my pictures. I don’t always see my site name showing up in Pinterest. Thanks for the help and I can’t wait to see the rest of the series. I’m so glad you found it useful, Annamaria! Thank you!! While I doubt my blog will ever ‘take off’ for a multitude of reasons, it feels good to have a “to do” to at least make it a little more user-friendly and search engine friendly. Looking forward to the next installment! I love having a to-do list too, I’m much more productive that way! I love this series. I can feel my eyes becoming a little less glazed over. I know what you mean about having a ton of ideas darting around your brain. That’s how I felt last year when I wrote my series! Thank you for going this!! I loved your series and have thought about doing something similar…except from an angle of making the changes that you talked about. Just not quite there yet. I often reference those posts, though! Cassie, thank you so much for this. I owe you!! Oh my gosh, Cassie! This is such a helpful post! I didn’t know that google Trends existed! I’m working on a post right now and just changed the title of it because what I wanted the title to be was literally not searched for at all…I also have been leaving alt text blank so your post has helped me a lot!! Thanks and hope you’re enjoying your weekend! Oh man. How I dislike this SEO stuff. I know it’s important and all, but I feel like it takes up so much time. Oh well. I understand it’s needed if I want people to actually find my posts. Is titling your photos the same as titling the actual photograph. I’m talking about when people actually add text to the picture. Does that have an effect on your SEO or us it just for looks? Hey Gerry, the text on the photos is purely for looks. Titling and adding alt text are the keys for search engines. This is so helpful Cassie! I am excited for my homework and for your series to continue! Do you use both of the recommended wordpress SEO plugins? This is such great information. Thank you for doing this. Until now, I had no idea where to start when it came to SEO. Thank you so much for this guide! I’m a brand new food blooger (with a geeky twist) and I had no idea what I was doing when it came to SEO prior to reading this. Thank you! Hi Cassie, Thank you for all of this great information. I had a quick question. Is it okay to post your url in the Alt text instead of the title? I noticed that when someone pins one of my images the Alt text is what is displayed in the description on Pinterest. Can you also put hashtags in the alt description as well? Thanks for any advice! Thank you so much for this series. I’m brand new to food blogging and looking for keywords and SEO help. Do you have a keyword list that can be referred to? Hmm, that’s a good question but in short, no I don’t have a keyword list. Keywords are unique to your blog post and should be relevant to what you are posting about. Google trends (talked about in this post) can help you asses which keyword(s) would be most useful based upon search terms. I hope this helps. Thanks for reading! I read this post when you first published it, way back before I had my own blog. I’m coming back to it now that I actually need the information, and it’s super helpful. Thanks so much, Cassie!! Holy moley! I was uploading my images without any titles. I’ve now fixed most of them, but as you say, I’ll update a few every night to get to all of them. Just the info I’ve been looking for, thank you! this is awesome. thank you so much for posting this. you are a big help!!! Actually, I was searching for SEO for food blogs and you made my day. Thank U. Just what I needed, thank you so much for this! I strongly agree – Yoast is helping you a lot and makes sure you don’t forget any of the various infos to put in for a succesful SEO. Thank you so much. I absolutely enjoyed reading this post. The detailed explanation was really helpful. I’m new to food blogging, I didn’t understand anything about SEO, but after reading this, I’m going back to update my posts. I can’t wait to read the rest of it. Hi Cassie! Thanks so much for posting this! I dont know if you are still writing these series but I just found it and good thing because I need help ha! So first question is about titling photos. what do you do on subsequent photos from one post? On WordPress I am unable to title 2 pictures the same. For ex: Eggless Vanilla ice Cream can only be used to label 1 photo. To label another photo I would have to change the title. How do you get around that? Also, my permalink shows this…Permalink: http://www.thegoldenbeets.com/classy-eggless-vanilla-ice-cream/classy-eggless-vanilla-ice-cream1/ . How do I delete the last repetitive “classy-eggless-vanilla-ice-cream1/? That is the title of my second picture….oh gosh too many questions sorry! Thank you! With your detailed clarification on Food recipe blog tips, I was able to bring my website a good authority. Thanks a lot. very useful tips thanks for sharing with us..